Experiential Learning At Its Finest. A passionate commitment to foreign language acquisition is a deep tradition at The Wood Acres School with formal Spanish language instruction for our students beginning in the Three Year Old Program. However, with the official designation as an International Spanish Academy (ISA), The Wood Acres School offers a truly bilingual learning environment where students will have both linguistic and multi-cultural competence in Spanish by the end of eighth grade. Bilingual instruction increases in frequency through Grammar and Upper School, enabling students to apply their Spanish language skills and increase comprehension. Students learn to effectively express themselves in Spanish both conversationally and in an academic setting. Graduating Eighth Graders will receive recognition of their work and efforts with an ISA diploma. Encourage students’ academic success in all subjects of the curriculum. Educate students in the values of multicultural education to foster international communication and respect among different cultures. Train students to express themselves and effectively communicate in English and Spanish in their personal relationships and in an academic setting. Facilitate and promote the access of students to prestigious centers of higher education throughout the U.S., Spain/Europe and Latin America. Prepare the students for their professional development in an international context. Promote the participation of distinct groups and social sectors of the community in an integrative, educational project. An ISA can be established in a school, or division within a school (elementary, middle or high school), that is starting or is already developing a quality educational program in English and Spanish. Access to double academic certification for high school graduates completing a full ISA program. The ISAs embody an integrated curriculum that will prepare the students to later participate in international programs of recognized prestige to complete their higher education degrees. The language of instruction is English and Spanish, the exact proportion determined by the school, bearing in mind that the objective is to obtain written and oral competency in both languages. A general component that incorporates the content required of all students at specific grade levels of The Wood Acres School. This refers to the school’s established curriculum and the school’s own evaluation. The special character of this program results from the fact that a significant part of the instruction is delivered in Spanish as students progress and the program grows at Wood Acres. The specific component does not necessarily imply increasing the amount of instruction time, but rather making an effort to integrate it into the general curriculum of our school. The means of integration is to be decided by the school that opts to become an International Spanish Academy. ▪	Communication in the Spanish language. ▪	Cultures of the various Spanish-speaking countries. ▪	Connections with other subjects: Thematic Unities. ▪	Comparisons of languages and cultures. ▪	Communities: Use of Spanish in and outside the school environment. Students at The Wood Acres School begin the study of the Spanish language and culture in the Three Year Old Program. With this early start, a formal sequential curriculum, and a proficient faculty, students have a chance to achieve academic success and that which eludes most language students- proficiency. Children are introduced to vocabulary and basic grammar to communicate about their school, home, clothes, and food. They also learn about Hispanic traditions, culture, and geography and learn how to appreciate the diversity of an ancient yet modern culture. Even the youngest students quickly learn that Spanish is everywhere in their home and school communities, city, and state! A natural bilingual approach to the vocabulary of early reading and the acquisition of early math skills makes the creation of a growing bilingual environment possible and well supported by faculty and parents. Curriculum for young students in the Early Childhood through second grade programs comes from an integrated model of linking Spanish vocabulary, language development, and culture directly to the curriculum. Program or grade-level curriculum is then linked with the goals of the comprehensive Spanish program. This two-way programming permits students to learn the language in both the traditional Spanish class as well as reinforcing language acquisition in the regular classroom. Programming notebooks are kept each year with improvements recommended by faculty input. Wood Acres’ young students learn best by hearing the language well spoken (and sung and read) by native or well-qualified Spanish teachers. 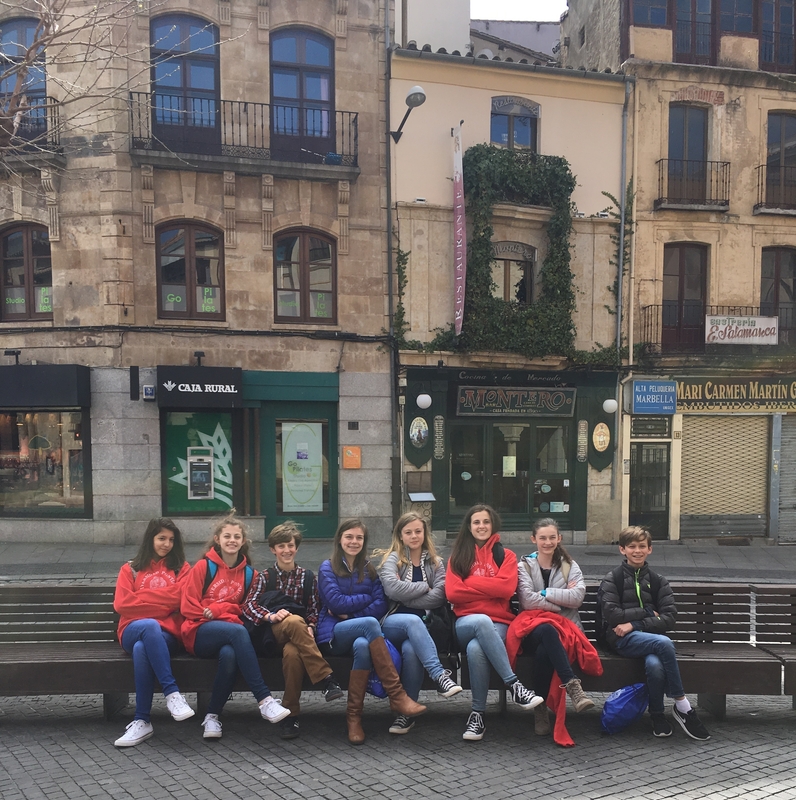 Speaking, seeing, exploring, and writing the language allows students to learn the nuances of Spanish and its relationship to English and other languages. Beginning in first grade, the formal curriculum Colega (published by SGEL in Madrid, Spain) is introduced. Developed specifically for young learners of Spanish by language experts in Spain, the curriculum exposes students to the language through songs and games as well as shorts texts, guided speaking and listening activities, tongue-twisters, chants and written exercises. Students are provided with a student’s book for classroom work that is specially designed to encourage class participation in Spanish. Additionally, the students receive a richly illustrated workbook, which contains review activities. In the Upper School (5th through 8th grades), students begin studying with the Spanish language series Espacio (published by SGEL in Madrid, Spain). More adolescent in its approach, Espacio exposes students to grammar, more challenging vocabulary and texts, as well as a range of discourse types. Students are provided with both an engaging student’s book for classroom work and a workbook with review exercises. Additionally, students begin to do more extended reading in Spanish starting with short stories and non-fiction texts and culminating in chapter books. It is through this extended reading that cross-curricular learning is facilitated with the use of scientific, historical, biographical and narrative texts. Upper School students continue their linguistic detective training to become more proficient at discovering how Spanish and English work on their own. With continued guidance, students gradually master language learning and study strategies that help them to become independent language learners. At the same time, their ongoing contact with Spanish renders them more fluent so they are able to do more “without thinking”. At both the Grammar and Upper School levels, the curriculum is richly supplemented with additional texts and language learning materials from both Spain and other Hispanic language resources. Students also watch films in Spanish (with Spanish subtitles) and through the internet are able to watch Spanish television, news broadcasts and commercials. Finally, the internet is used both in class and out for researching topics in Spanish as well as carrying out review activities. Instructional methodology includes TPR (total physical response), pair and group work, repetition drills (usually done through songs and games), competitions, reading aloud and thematic projects. Curriculum development, scope and sequence development, instructional strategies and materials acquisitions have been driven by national and international standards, as well as extensive research in the field and ISA recommendations. Assessment at Wood Acres evolves from Early Childhood to Upper School. Initially it involves mainly teacher observation and authentic qualitative assessments of daily classroom performance. Gradually, formal quantitative evaluation is incorporated including, at the highest level, oral and listening exams, writing assessments, oral presentations, and unit tests. The results of both formative and summative methods of evaluation are used in grading students for report cards and progress reports to parents. With regard to external and/or official evaluation, Wood Acres will pursue online training in the SOPA and ELLOPA assessment tools (oral assessments for students in the lower and upper grades) when offered through the Center for Applied Linguistics so as to consider their eventual implementation in ensuing academic years. The Wood Acres School has a passion for education, not just schooling. This educational passion and enthusiasm embrace not just the educational destinations of high school graduation and university study, but also the journey that each student must take to get there. This journey is an international one that knows no political boundaries, just the boundaries of attitude and aptitude. To learn a language is to learn a culture. To learn a culture is to learn a people. To learn a people is to learn a country. To learn a country is to better understand your native country from another’s perspective- a global view of the inter-connectedness of the world. This is an educational imperative at Wood Acres and the very basis for International Spanish Academies. As an International Spanish Academy (ISA) school, Wood Acres sees no boundaries as to the integration of the Spanish language into all aspects of student learning. As an ISA community Wood Acres models for others the richness and depth of a well-crafted curriculum taught by talented and enthusiastic professionals who themselves are lifelong learners. ISA is and will be in the very fiber of Wood Acres and in the very essence of who we are as an outstanding independent Early Childhood through Upper School learning community. Founded in 1969, the Wood Acres School celebrated its 40th year of teaching and learning in the Fall of 2009. What a grand birthday gift it was to receive the honored designation of an International Spanish Academy at that special time! The International Spanish Academy has become the book from which Wood Acres has grown its academic wings to fly by embracing a true education for 21st century students.